How odd that the election of the new chairman of the Republican National Committee (RNC) should end in a dead heat between a Southern, “true” conservative who had to admit only just having left a whites-only country club, and a black Republican from Maryland who stood accused of being too moderate. Kudos to the Republicans for recognizing just in time which way political suicide laid, and turning the other way at the last moment. All the sordid details about Michael Steele’s narrow victory over Katon Dawson and the terminally slow drop-outs of all the other candidates in a surprisingly enjoyable Twitter feed from the WaPo’s Chris Cillizza. Foremost (h/t The Plank): The question to guide your day-to-day life in this new era. But he had that all wrong, he realised today, after some constituents helpfully called in to remind him. In reality, he corrected himself in a statement titled “Gingrey comments on Rush misunderstanding,” Rush Limbaugh is not just a “voice [..] of the conservative movement’s conscience”, but … a “conservative giant”. Who are the hottest professors? In love with your prof? If so, he/she is likely to lecture languages. There is “Real Social Scientific Data” (mind your footnotes) on the relative hotness of the different disciplines, which comes via Prof. Henry Farrell (Political Science, ranked fifth) at the Monkey Cage. Law and criminal justice take a prominent second and fourth place (out of 36) in the ranking, which might please fellow blogger Joefromchicago. Unsurprisingly, engineering, computer science and chemistry rank at the bottom, so pity the poor professors in those duller disciplines — after all, tenure without temptation is like aspersions without alliteration. After the phenomenal success of books such as Freakonomics, Undercover Economist, Armchair Economist [..], every economist is under pressure to come up with some innovative approach to explain mundane things in life. Forget earlier topics like “Why aid doesn’t work in Africa” or “Implications of direct cash grants on Philips curve” that used to keep economists intrigued; the best talent in business are now looking for more relevant topics. And even though some of the most pressing issues facing mankind such as “Overpricing of the hotel mini-bar” (Tim Harford) and “socioeconomic patterns of naming children” (Steven Levitt) have already been worked upon, there still remain some fundamental questions that remain unanswered. For example, “How many love songs are written for every break-up song and why” or “why do men wash underwear less frequently than women”, or “Why does Ronald McDonald not get fat”? Where are Americans moving to? And from? Talking about comparative hotness – which states of the US are hemorrhaging homes, and which ones are rapidly reeling in the residents? Earlier this month, Patrick Ottenhoff dug into the demographics on domestic migration between 2000 and 2008, and put up a map on The Electoral Map. It’s not as simple as cities versus flyover country, he emphasises: loser states cover a contiguous chunk of territory from Massachusetts to Nebraska, while most of the states strongly gaining ground are clustered together in the West and on the Atlantic seaboard from Virginia to Florida. 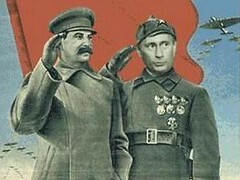 What’s the real reason Putin handpicked Medvedev for President? Of course, or so the cheekier of conventional wisdoms go: term-limited out of the Presidential office, Putin needed someone to keep his seat warm while he played Prime Minister for a few years, so he could return to the Presidency soon enough. But why Medvedev? Why, his luxurious head of hair of course. It’s the only way the steely-eyed leader could deal with the longstanding law of succession when it comes to ruling Russia. 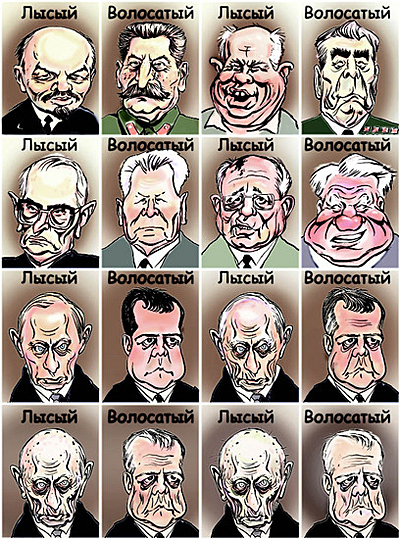 Lenin – bald; Stalin – hairy; Khrushchev – bald; Brezhnev – hairy; well, you get the idea. Gorbachev was bald, Yeltsin hairy, and well – let’s be honest, Putin isn’t particularly blessed in this regard. By choosing Dmitry last year, Putin bent the Bald-Hairy Theory of Russian Leaders to his will to power – and the two can rule till death do them part. This story’s from last Sunday, but I just need to belatedly highlight it because – well, it seems to sum up so much about that particular mix of unscrupulousness and incompetence we’ve come to know so well from the outgoing administration. You’ve also got to love how the CIA and Pentagon busily pass the blame to each other. But in the end both simply acted on the clear message from above that building actual cases about the detainees’ guilt was all but irrelevant. Guantanamo was just a place to shut people away you didn’t want about – end. Indefinitely, apparently – God knows what they thought would have to happen with them in the long-term. Looks like there was no long-term concept of where any of this would be going, period. President Obama’s plans to expeditiously determine the fate of about 245 terrorism suspects held at Guantanamo Bay [..] were set back last week when incoming legal and national security officials — barred until the inauguration from examining classified material on the detainees — discovered that there were no comprehensive case files on many of them. Instead, they found that [..] a Cabinet-level panel named to review each case separately will have to spend its initial weeks and perhaps months scouring the corners of the federal government in search of relevant material. Massive deregulation of the financial services industry has led to the worst financial crisis since the Great Depression. We need a treasury secretary who will support strong and robust regulation of the financial services sector. “Mr. Geithner was at the Fed and the Treasury Department when the deregulatory fervor that got us into this mess ran rampant. He was part of the problem. I hope he becomes part of the solution, but I could not support his nomination at this time. Meanwhile, I dug up this link from 1998 that may provide a bit of backstory hinting at the larger ideological disagreements at play. Back then, Bernie was still in the House, and Geithner was Assistant Secretary for International Affairs at Clinton’s Treasury Department. Geithner came to the House to testify in a review of the operations of the International Monetary Fund (IMF). Later on, of course, Geithner would himself move to the IMF. Sanders was (and I assume still is) a harsh critic of the IMF, as his introduction in the review illustrates, and had a rather contentious exchange with Geithner, in which he accused him of disobeying the law. Why, for one – he asked citing the State Department’s human rights reports on Indonesia – did the US not vote against IMF loans to General Suharto’s Indonesia? Why did it not oppose IMF loans to authoritarian governments that violate human rights and jail labor leaders? So I was listening to some 70’s era rock this weekend and came across a STYX song written for the Bicentennial. STYX was known to include a political song here and there on their albums, but this one struck me because of how it resonates with President Obama’s inauguration speech. Maybe the President listened to it when he was a teenager. OK, it’s not deep, but here are the lyrics for your enjoyment. Chekov at Three Thousand Versts of Loneliness highlights the extent to which the most unusual of political alliances has entrenched itself in Northern Ireland. For a little over two years now, the government is made up of Sinn Fein – the long-time political arm of the IRA – and the DUP, the hardline Unionist party that was led for close to fourty years by the rabblerousing Rev. Paisley. Yesterday, in an ill-tempered display, First Minister Robinson hit out at the UUP, Alliance and SDLP for co-operating on the Financial Assistance Bill. He had the cheek to describe the three parties as an ‘unholy alliance’ – on the same day as he and his party trooped into the voting lobbies 6 times with their friends in Sinn Fein. [T]he closeness of the DUP-Sinn Fein alliance is now obvious for all to see. Two parties, conceived in sectarianism and bound together by a mutual loathing, but united by their arrogant contempt for those parties who dare to hold them up to scrutiny in the Assembly. Mr. Robinson was entirely right that an unholy alliance exists – the problem is that it is an alliance of his party and his colleagues in Sinn Fein. Eloquent – I love the “Two parties, conceived in sectarianism and bound together by a mutual loathing” bit. And yet, there’s something reassuring about seeing a cross-sectarian opposition arguing against a cross-sectarian government and making the kind of accusations (bulldozering through legislation and the like) that could feature in any country. An opposition primarily identifying itself, not along religious or nationalist lines, but as a “positive, democratic” alliance whose first priority is enforcing accountability and good governance – even if it’s all situational, that’s a long way from Northern Ireland’s not all too distant past.